Father Kunst has a deep devotion to the saints as can be readily seen in viewing the Saints & Blesseds section of this site. Sr. Lucia was intimately involved with the apparitions at Fatima. We invite you to visit Papal History/Saints & Blesseds to view the many canonized and beatified men and women who make up this section of the Collection and contributed so much to the building of the Kingdom of God. The check is framed with a holy card printed on the occasion of her fiftieth anniversary at the convent. The check was given to an extern nun (one who is able to leave the convent) and this same nun gave the holy card to me. Sr. Lucia had a very strict policy against signing autographs. I obtained this one by making a check out to her personally and delivering it to the convent where she was cloistered in Coimbra, Portugal. 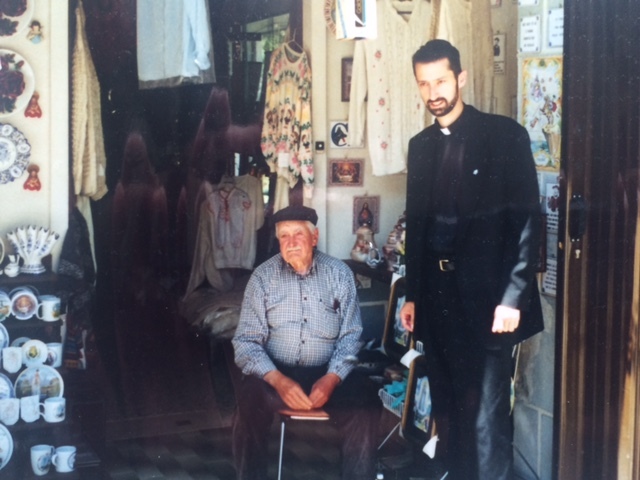 I was able to travel to Coimbra, Portugal in 1999 to the convent where Sr. Lucia was living. She was one of the seers of Our Lady of Fatima, an event that occurred over a period of months in 1917. In 1999 she was the only one of the three children still alive. It was very difficult to have any type of connection with her because of her cloistered life and because of the many people seeking information from her, particularly about the third secret of Fatima about which people wanted information. Her autograph is highly sought. Even cardinals have tried repeatedly to get it without success. So I brought a check for Sr. Lucia directly to the convent. I received assistance from a friend who wrote it in Portuguese. If she wanted the money she had to endorse the check. Six months later the canceled check was returned to me with her endorsement. Sr. Lucia died in 2005. Sr. Lucia Santos was born on March 22, 1907. 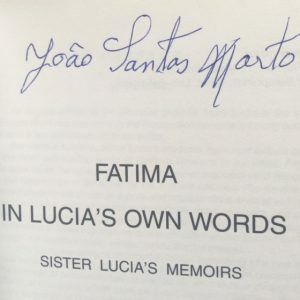 Lucie Dos Santos was only 10 years old when the Virgin appeared to her and her two young cousins, Francisco and Jacinta Marto, on a field outside the town of Fatima, on May 13, 1917. The apparitions continued through October 13 of that same year, and the seers conveyed Mary’s predictions of World War II, the rise of Russian Communism, and the urgent need for the faithful to pray the Rosary. Sister Lucia also revealed the famous “third secret” of Fatima, which was kept secret by successive popes until May 2000, when John Paul II revealed the text of a mystical vision involving a bishop dressed in white who was struggling toward the Cross, over the bodies of martyrs, until he himself was felled by gunfire. Pope John Paul concluded that the vision referred to the attempt on his own life. Some Catholics continue to insist that aspects of thethird secret have not yet been disclosed, although the Vatican insists that there is nothing more to reveal. Sister Lucia had spoken of the Fatima promises in four published memoirs, but kept the third secret hidden. She divulged that secret to the Bishop of Leira, Portugal, in January 1944; he confided the secret to Pope Pius XII. Sister Lucia had said that the secret should be revealed at the Pope’s discretion, but not before 1960. 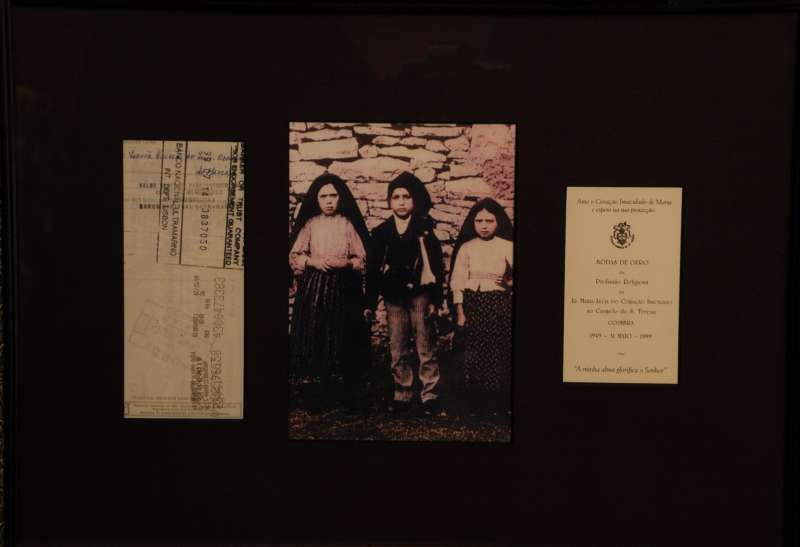 Francisco and Jacinta Marto were beatified by Pope John Paul in ceremonies that took place at Fatima on May 13, 2000– the anniversary of the first apparition there. Both Francisco and Jacinta had died in their youth– in 1919 and 1920, respectively. Sister Lucia made a rare journey outside the Carmelite cloister to take part in the ceremony. After the Fatima apparitions, and subsequent personal visions of the Virgin in 1923 and 1929, Lucie Dos Santos entered religious life– first in Spain and later, in 1948, as a Carmelite in Portugal. Sister Lucia, the last survivor among the three Portuguese children to whom the Virgin Mary appeared at Fatima, died at the age of 97 on February 13, 2005 at her Carmelite convent in Coimbra, Portugal, after a long illness. Living in isolation in the cloistered convent, Sister Lucia had reportedly lost her eyesight and hearing in the months preceding her death. We are grateful to Trinity Communications for the use of their biographical information about Sister Lucia Santos. 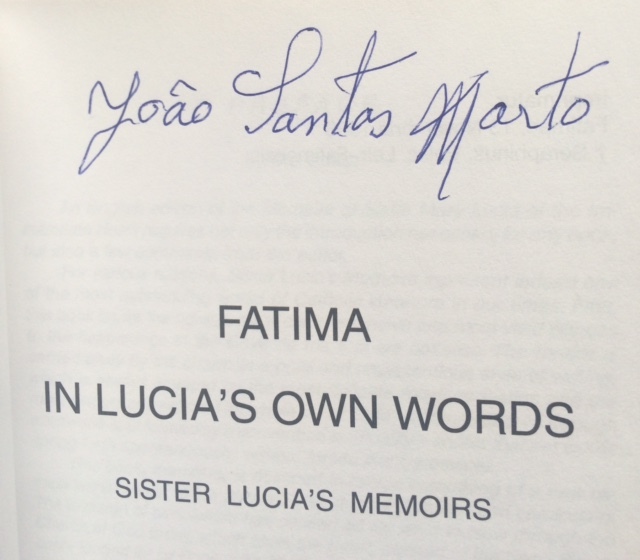 In 1999, Father Kunst purchased a copy of Fatima In Lucia’s Own Words: Sister Lucia’s Memoirs. The photograph above is of John Santos Marto, younger brother to (now) Saints Jacinta & Francesco Marto. He was 93 years old at the time of this photograph and died just a few weeks before his siblings’ beatifications on May 13, 2000. 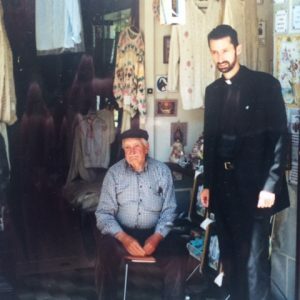 I was leading a group of pilgrims from Brainerd, Minnesota, (where he was assigned at the time) to Fatima, and we went to a store owned by relatives of the Marto family. It was there that I purchased the book. He was outside, so I asked for him to sign it and for a photo with him. It was actually the second time I met him: In 1989 I was in Fatima for a pilgrimage. At that time he still lived in the family home he grew up in, the same house in which his two canonized siblings were born, so the house was (and is) quite an attraction. He was very gracious in visiting with pilgrims, who I am sure came from all over the world. Father Kunst was present at the beatifications of John Marto’s siblings in 2000. It adds to the lore surrounding the Fatima appearances of Our Lady to have this keepsake from the saints’ family. Their canonizations occurred on May 13, 2017, the 100th anniversary of Our Lady’s first appearance at Fatima.